Eurocell offers a wide range of Roofline products including Capping Board, Euroboard, Ogee Board, Utility Board, Soffit Board, Cladding, Ventilation, Dry Verge System and Accessories. The Euroboard system is a direct replacement and new build package. Euroboard itself is 18mm thick and is strong enough to be fitted direct to the roof rafters. Eurosoffit fully compliments the.Euroboard system featuring neat integral ventilation slots giving an airflow in the roof space. Euroboard can be used with alternative soffits giving a choice of presentations. A superb quality board of a full 22mm thickness, also available in 9mm, featuring the distinctive Ogee profile giving the finished project an outstanding individual appearance. The Ogee Board may be used most effectively with a variety of accompanying boards to complete your presentation. It should be noted that 22mm thick Ogee profile is a direct fixing board and similar to the Euroboard profile, is designed to be fitted direct to the roof rafters. The 9mm thick profile should be fitted to a new timber sub-straight. Eurocell offers Capping Board with a choice of soffits. The resulting presentation is smart and cost effective. When fitting Capping Board check thoroughly on the condition of the structural timbers, making sure that they are sound and completely rot free. The capping board itself should be fitted to a new timber sub-straight, since this procedure will result in a first-class long lasting installation. Eurocell offer a choice of Soffits. There is a 9mm thick Utility Board in widths from 100mm to 450mm and certain widths ore available vented. An alternative is the 100mm or 300mm wide Hollow Soffit, which gives a decorative smart finish at a competitive price. Eurocell offer a comprehensive range of roofline ventilation products, adaptable for every possible installation. The Finial and Joint trims offered as part of the Eurocell Roofline Range, help achieve ultra high levels of finish on every job. Eurocells 125mm shiplap cladding is designed with an extended tongue and groove leg which helps make for neat and smart installations. The planks are complimented by a selection of dedicated trims that complete the cladding system. Dry roofing is the term used to describe the mechanical fixing of certain areas of the roof without the use of mortar. With the increased incident of storms over the last few years the unreliability of mortar has been clearly highlighted. The gradual switch to dry roofing in Britain looks set to gather pace. 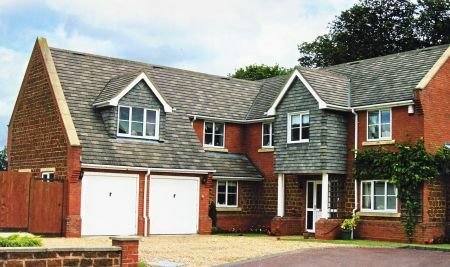 The Uni-Dry verge is designed to provide a simple secure method of mechanically fixing verge tiles to reduce the risk of damage casued by wind uplift and water penetration. Available in terracotta, slate grey or brown, to blend with the rest of the roof. Eurcell's roofline products carry a ten year guarantee against manufacturing defects providing that all installation and care instructions are strictly followed.